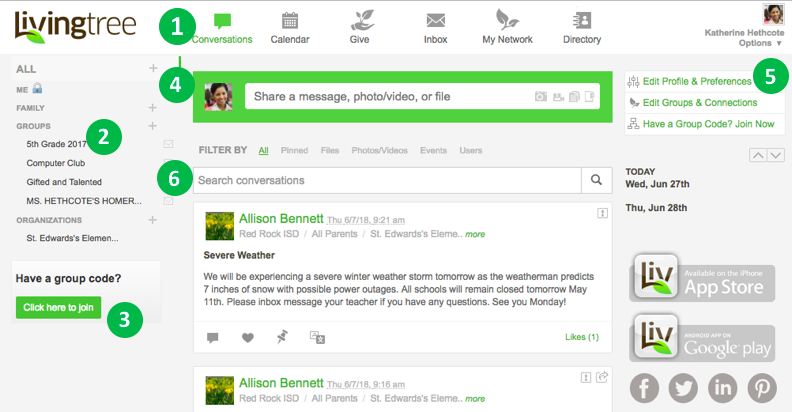 Livingtree is your private social network for parent and student engagement. In this guide, we’ll will walk you through the basics of your account, and share a few tips for a successful year of engagement on Livingtree. Think of Conversations as your homepage. Here you can share a post with any of your classes or staff groups. You can also scroll through your stream to view and respond to the posts that have been shared with you. Your left navigation pane lists the connections you have in Livingtree. As a teacher, your classes are listed under GROUPS. Click on any group in your left nav to filter your feed or calendar on the content shared with that group only. Click the envelope icon to invite a parent or student (via email or group code) who is not yet connected to the class. Clicking on the ‘+’ button next to each group-type (FAMILY, GROUPS, ORGANIZATIONS) will prompt you to create a new LivingTree network (family/class/etc.). Group Code is one way to connect to a group. If you have been given a group code, you can enter it here. When you are ready to share a post, click on the type of post you want to share. Click here to: edit your profile & preferences, view or edit your classes, or enter a group code. How to Share a Post! Jumpstart your classes’ Livingtree experience by sharing with your parents and/or students right away! Recipients will see anything you’ve shared with them as soon as they log in. Click on ‘Messages’ ‘Photos’ or ‘Files’ or ‘Text’ to begin. If you are posting photos or a file, click on the respective icon. You will be able to upload photos/files from your device. If you like, add a subject line for your post. Type your message in the message field – use the formatting buttons if you want to get creative! Click on the sharing dropdown to select your recipients (you can select as many groups as you like). If you want to send out a notification for your post, be sure to check here. Otherwise your post will drop quietly into your recipients’ feed. You can also disable comments for your post and allow re-sharing (if you’d like recipients to be able to share your post with other LivingTree groups). Click ‘post’ and you’re done – recipients will see your post in their Conversations stream. This is where you can view all of the events that have been shared with you, and where you can create and share events with your classes or staff groups. Events can include reminders, volunteer tasks, RSVPS, notifications, and more! While you can share with all of your groups in Conversations and Calendar, Inbox is perfect for reaching out privately to any staff member, parent, or student. No need to know email addresses – just type your recipient’s name in the ‘To’ field. They’ll receive your direct message in their Livingtree account. They’ll also be notified of your message via email/mobile. Here’s a complete list of the people connected to your Livingtree groups. Just click on your class or school to see the list of contacts within each group. You can click on a contact’s name to view their profile, or send them a direct message. Download the Mobile App. After you have signed up or customized your password on the web, be sure to download the free Livingtree app on your iPhone and Android device. You can use the app to post photos, messages, announcements, view your feed, send private direct messages, and more. Remember to notify. In the first few months of the school year, it’s best to check that ‘notify recipients’ option each time you share something with your class(es). If you do not check this option, the content will drop quietly into your recipients’ feed. Later in the year, only notify on time-sensitive posts, or when you want to get the message out right away. Share with your fellow staff members. Sometimes class activities, announcements or homework assignments are relevant to your colleagues as well – or sometimes it’s just fun to see what other classes are up to. To add your staff as a recipient of your posts, click the school from your dropdown and select your staff group. Add a profile picture. Click on the ‘edit profile & preferences’ page to upload a photo of yourself, or a photo of your class’ icon or school mascot. Go Green ~ Go LivingTree. Share homework, flyers, syllabi and more as file posts in Livingtree. You can share multiple files (Power Point, Excel, Word, etc.) in a single post. Recipients can go back to your file post anytime. Share photos. Livingtree is a safe place for you to share photos of your students; and with the Livingtree app, it’s easy to snap and share photos throughout the week. For parents who do not get to see the everyday activities at school, one photo truly is worth a thousand words. Utilize Livingtree as much as possible & encourage your parents and students to do the same. Let parents and students know that Livingtree is their two-way engagement platform – Meaning Livingtree is a safe place for them to share any class-related questions, comments, group or direct messages – all in their preferred language. We hope you enjoy using Livingtree.